The Exceptions & Sourcing queue shows the orders that are queued pending to be sourced for the next sourcing wave. 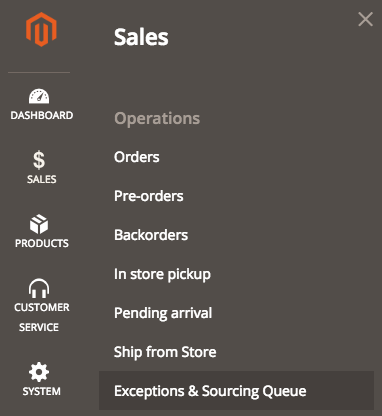 You can quickly search an order by Order ID, Store, Order Status, and Shipping Method, using the filter fields. This page displays all orders that have at least one soft allocated line. It provides visibility to orders with exceptions. The list is arranged in order of creation date (older orders are at the top of the page). From this page, it is possible to access the manual action page. Orders with exceptions are visible in the Exception queue but will remain in the allocation queue as the Source Engine will try to source orders with exceptions in the next run, if no manual actions have been taken. To have access to this page, the role assigned to you user should contain activated Sales Management > Manage backorder or Stock Management permissions. This page is filtered based on the sales channel selected on the Allow access to Sales Channels at the role level.